A sign painter and his young apprentice sat one afternoon in a park near the center of town. It was a slow work day. In times like this, the two painters spent hours practicing their craft. They created portraits of people in the park for fun and sometimes for money. The apprentice set down his brush. He pointed past the willow trees and honeysuckle bushes to where the police barracks stood on the other side of the street from the park. "Yesterday, the police beat my friend," he said. "How did that happen?" the old master asked, one eyebrow raised. He did not put down his brush. He finished adding a gentle line to his ink sketch. "He was in a fight." The apprentice shook his fists. "He called for the police but instead of helping him, they beat him along with everyone else they arrested. Later, they put him in a cell with the men who had been beating him. So he was beaten further." "Why were those men hurting him in the first place?" The master set down his brush with care not to disturb the sharp point of its bristles. "To take his money?" "No, it was over politics." The master thought about that for a while, hands on his knees. "So he got into an argument," the master ventured, "one man against many. Instead of backing down he decided to fight. Is that right?" "And when the police arrived, they found many men fighting. From their point of view, they ended the fight and threw everyone in jail." "But he was calling for them. The police are supposed to distinguish right from wrong. Shouldn't they have helped him?" "He said they hit him right away." "Did he hit them back?" The master sat and watched the crocuses and honeysuckle plants sway in the breeze. "Your friend lives, as many people do, with ideas in his head of how the world should work." "It is has always been my aim, as a painter, to let go of preconceptions. That is because I think it best to draw what is there, not what I think I should see. Art is misleading enough already. Anyway, it is not so very hard to see what is really there. Animals can do it. Do you think a fox would fight a pack of wolves? Would an animal make such a mistake?" "More pity that we do not observe the truth. If your friend avoided assuming the world is other than it is, he would not have thought the police would understand his view immediately. He would have seen them as the ordinary people they are." "That does not excuse the police." The master nodded. The sign painters sat side by side for a minute. Breezes shook the trees and the bushes. After a while, the old man said, "Can you tell me why the cabbage butterfly avoided those flowers?" "Has it?" asked the student. "Yes." The older fellow pointed. "Can you see the mantis nearby? It is shaking the leaves as it stalks." "Ah, now I see. That's a large mantis. But the shaking is hard to see in the wind." "No, the shaking is different from the wind. In the insect world, I expect it is a loud, obvious thing. Yet the mantis does not care. It is counting on the wind to cover it. And it must be right about the cover, too, because it lives. It eats insects who tell themselves, for a moment, 'oh, the wind is moving the leaves.' They do not see the mantis until it is too late." They returned to their painting. 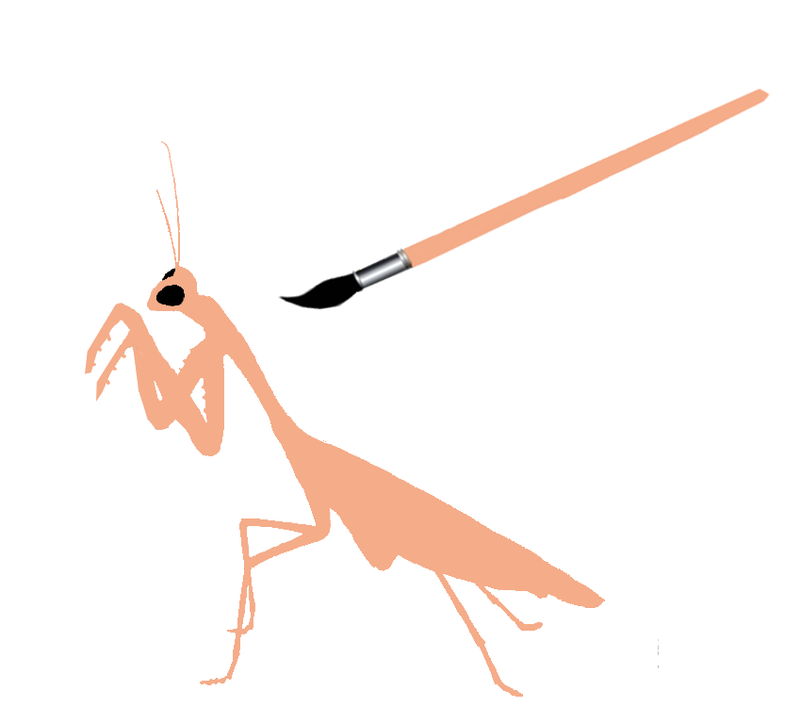 The student, having nothing better to do, decided to paint the mantis. It stalked among the honeysuckle leaves quite slowly. In each great gust, the mantis lowered all its limbs and clung tight to its perch. In the softer breezes, it moved one limb, then another. It shook the leaves beneath it but the student painter found it hard to tell the difference between the wind and the effect of the mantis even while he looked for it. A different cabbage butterfly swept in but avoided the flowers near the mantis. It took a few minutes for another insect, a honeybee, to try its luck. As it passed close, the mantis snatched it out of the air. It cut the bee with its claws and began to devour it. "Ah." The master set his brush down. He placed a stone on his paper to hold it in the winds. "The butterfly, aware of its lack of defenses, observed closely. The honeybee did not." "Does this have to do with my friend?" "Your friend did not observe his situation as it was. He got into a fight because he thought being in the right would be an advantage. When he realized it was not, he called for the police. When he should have surrendered to the police, he fought them. Would you have done these things?" "Maybe. I think he was unlucky. I could get unlucky, too." "Yes, to those who do not observe the world, awareness seems like luck."